For those who've never seen or've forgotten my previous explanations of my reasons for using the unorthodox spellings that occur in these blogs as opposed to the gen·rally orthodox ones that appear in the principal division of this website, I shd like to say the following. Being intensely int·rested in and aware of how the words of languages come to be spelt the ways they are, I tend to be constantly disturbed by being obliged to employ spellings which are so very obvi·sly illogical and/or archaistic. I'm consequently inclined to wish to see how they might better be represented and to experiment with producing what seem to me to be improoved spellings. Blogs which are directed to an audience of people who may be considered largely likely to be mod·rately sympathetic with regard to my experiments seem to me to be a harmless outlet for these inclinations of mine. I'm in no way a spelling-reform polemicist in the sense of wishing to urge other people to adopt a particular whole new set of spellings. In fact I think such an aim wd be so impracticable as to be quite futile. The long history of the (British Simplified) Spelling Society seems to me to've demonstrated that. However, I consider the set of proposals which it formulated and completed over half a century ago to've been a very worthwhile fruitful enterprise even tho advocating their adoption is no longer a feasible proposition — if it ever was. What I am agenst are the bullying practices of editors in so many spheres. I'm an advocate of freedom and tolerance in the field of orthography. In my own writings I try to cause as little as possible hindrance or discomfort to readers while exercising a right I wish to claim to choose the spellings I use. It must be obvious that if one chooses to experiment with using more-logical etc spellings, it's impossible to maintain consistency of spelling — an aim that embodies a very mean sort of virtue. One principle I've tried to follow has been to avoid respellings that are so startlingly unlike the orthodox ones that ev·ry literate person is familiar with that they actually seriously hinder ease of communication even for tolerant well-disposed readers. Deciding exactly what items to place into such a hard-to-define category is bound to be a constant problem. An example is the word any which of course wd be so much better spelt enny or enni or eni but, so appearing in a text, wd I imagine, be such a distracting discrepancy from orthodoxy as to be likely to disturb the attention of or even puzzle most readers. So I expect might be the remooval of eg initial silent aitches, k's and w's especially from short words that wd result in homographs such as wen, not and rite (respectively). As readers of my various comments on English spelling and its reform will be unsurprised to hear, I heartily endorse the views exprest by John Wells (President of the Spelling Society) in his blog of the sev·nth of March 2008 (now unfortunately no longer retrievable it seems [See PS below]) "people should be able to use whichever spelling they prefer". The comment from Greg Brooks (Emeritus professor of education, University of Sheffield) that JCW quoted to the effect that spelling changes he'd approve wd hav· to be "official – not alternatives to existing spellings" and the ('English') Spelling Society's chairman Jack Bovill's remark that ‘Accurate [sic] spelling is of the utmost importance" show that Wells has an uphill task to persuade people of the reasonableness of his views. There were forty-seven comments on that Wells blog. Among them Commenter "vp" referred to the remark by Martin Ball that he'd given up reading my blogs on account of their spellings. Of course I was flattered that he ever started but Ball's possibly ironic remark ended with a 'smiley' emoticon. Anyway 'vp' sed "I haven't given up, but I do find some of his phonetic spellings rather strange. He uses "praps" for "perhaps", for example, which is a realization I rarely if ever hear or use in conversation." Praps I'm old-fashioned but 'praps' has a good pedigree. Daniel Jones seemingly considered it the usual conversational form of the word in his day as one might gather from his Outline of English Phonetics of 1956 at a footnote to §756. Incident·ly I usually refrain from using the spelling 'paps' which wd' represent a common pronunciation I and others use in conversation. Another, rather wise, comment of vp's was "The problem when you mess with words as common as have and do is that you create the maximum of bother for the minimum of benefit. The commonest words are the ones we all remember, so anomalous spellings of them disturb us far far less than oddities in less familiar words." My readers may notice that such a consideration enters into many of my spelling choices in my blogs. The prime targets of my unorthodox spellings are items that irritate me by their irrationality and/or inconvenience, such as my 'dou·t' for 'doubt' and my 're·d' (for the past tense of 'read'). As my graphological adventures continue, readers may notice that I am currently using what Unicode calls a 'middle dot' in cases where I've had an apostrophe previously. This is for at least a couple of reasons including p·ticu·ly to reassure readers that I've not necess·rily simply committed a mis-typing in view of the fact that for whole stretches of what I write I might prefer to stick to orthodox orthography. I gen·rally use apostrophes where they are customary in representing speech or their use merely extends, but still harmonises with, traditional types of practice. Some of those who enjoy discussions on spellings may like to look at other blogs of mine concerned with such matters to varying degrees such as numbers 010, 047, 102, 129, 224, 225, 302 and 304. The '-street' suffix that Wells once referred to is commented on at Section 11 §3.1 of my "home page". By the way, the quarter-of-a-million-plus words of that "page", any reader will find, appear almost exclusively in "normal" spellings. This is to some extent related to the fact of the items being revisions of originals in which the spellings were what various editors of journals had in effect browbeaten me into employing. By the way, I claim the similar right to depart from various orthodoxies of punctuation when so inclined. A couple of such in respect of hyphenation've occurred in the present text. "He said, and I quote, "people should be able to use whichever spelling they prefer." He's the President of the Spelling Society. I say that he's wrong. And by the way, that's spelt with a 'W.'" ...Let’s return to a time when English spelling allowed greater variation... Nowadays we often see light written lite and through as thru. Let’s not hold up our hands in horror — people should be able to use whichever spelling they prefer. I didn’t mean that we should abandon all standards in spelling. I was referring to pairs such as these. I added a few more, such as the text messaging u alongside you. And I suggested we get rid of the apostrophe. I’m not calling for any dumbing down. I’m not calling for a free-for-all. I’m not suggesting we abandon all rules, just that we might relax some of them in a controlled way. I’m in favour of consistency, logic, and obeying the rules, in spelling as in other things. I just think the rules need to be modified." My thanks to Kensuke Nanjo for searching more successfully than I did and guiding me to John's blog of the 2nd of October 2008. I'm given to understand that a short passage for study by advanced students of spoken GB (General British English) wd be welcome in various quarters. Accordingly I've prepared a version of the widely known International Phonetic Association's specimen text, the Aesop fable story of The North Wind and the Sun, adapted to mainly exemplify direct speech of, on the whole, a mod·rately conservative rather than very modern style in the int·rests of students of a wide age etc spectrum. I've made it easy to adjust to by using only the phonemic symbols employed in the two major British English pronunciation dictionaries except for the very minor point of dispensing with the Gimson-style length marks which are in any case redundant rather than essential besides being capable of suggesting inappropriate values on various occasions. In addition to the representations of the phonemes, I've supplied very simple broad indications of intonation in a version easily comprehended especially by those with any familiarity with the types of notations found in the works of the British toneticians Kingdon, O'Connor-&-Arnold etc. Help in interpreting the tone symbols, if needed, may be found on this website at Section 8 Item 3 etc. The style represented is not that of totally spontaneous speech but of relatively animated (ie mod·rately spontaneity- suggesting) narrative reading. The two styles have very much in common of course. Readers may be int·rested to note that the passage contains one or more instances of all the 44 phoneme symbols required for GB. The segmental notation is strictly phonemic. The intonation symbols are (not tonemic but) tonetic for example showing the rising element of a Fall-Rise complex tone exactly where it occurs (except within single words) altho only the first syllable involved constitutes an accent. The vertical bar is used only where it seems necessary for clarification where the normal punctuation doesnt make it obvious where the boundaries between intonation phrases occur. Note that commas are not to be taken as prosodic boundary markers. Full stops of course are. 1. ˈwᴧn ˏdeɪ, | ðə ˈnɔθ ˈwɪnd | ən ðə ˏsᴧn | wə ˈhӕvɪŋ ən ˎɑgjəmənt. 2. `ˏ ju | kɑnt bi `hɑf əz strɒŋ əz `aɪ ˏӕm | ðə wɪnd wəz ˏseɪɪŋ. 3. `əʊ jes aɪ ˏӕm, rɪʤɔɪnd ði ᴧðə. 4. ˈʤᴧst ˏðen | ə `trӕvlər əpɪəd. 5. ˈwɒt ə ˈfaɪn ˎkləʊk, ɪkskleɪmd ðə wɪnd. 6. `jes. ɪ`t ɪz ˏnaɪs, `ɪzn ɪt? ӕdɪd ɪz frend. ɪz ɪt ́wɔm. 8. ɪf jul grɑnt mi ðӕt ˏpleʒə. 9. ́wɒt dɪd ju seɪ | ðeɪ ˏkɔrəst. 11. kən prə`ˏvaɪd | ðə dəˈsɪʒn ju rɪˎkwaɪə. 12. ˈwɒt dju `min? snӕpt ðə wɪnd. 15. ˈhil bi ˈrekəgnaɪzd əz ðə ˎstrɒŋgə. 16. ˈɔl ˏraɪt, sed ðə wɪnd | ʃəl ˈaɪ traɪ fɜst | ɔ wɪl ˎju? 17. `ju stɑt, rəplaɪd ɪz kmˏpӕnjən. 19. bət ðə `ˏweɪfeərə | ˈəʊnli ˈrӕpt ɪz ˈmӕntl | ˈtaɪtər əˎraʊnd ɪm. 20. ˈӕt ˈlɑst | hi ˈsɪmpli ˈhӕd tə | ˈgɪv ˈᴧp | ðə ˎstrᴧgl. 21. ˏðen | ˈəʊld ˈsɒl | ˈʃɒn ˈaʊt | ˈrɪəli ˎpaʊəfli. 22. ɪ`ˏmiʤətli | ðə ˈpɔ ˈfeləʊ | wəz ˈfɔst tə ˈteɪk ðə θɪŋ ˎɒf. 23. `ðeər i saɪd. ˈðӕt ˎsetlz ðə mӕtə. 24. `wel. aɪ səˈpəʊz aɪd ˈbetə bi ˈgetɪŋ əˎlɒŋ. ˈgʊd ˏbaɪ, ðen. 1. One day, the North Wind and the Sun were having an argument. 2. “You can’t be half as strong as I am” the Wind was saying. 3. “Oh yes I am,” rejoined the other. 4. Just then a traveller appeared. 5. “What a fine cloak!” exclaimed the Wind. 9. “What did you say?” they chorused. 12. “What d’you mean?” snapped the Wind. 17. “You start”, replied his companion. 19. but the wayfarer only wrapped his mantle tighter around him. 20. At last he simply had to give up the struggle. 21. Then old Sol shone out really powerfully. 22. Immediately the poor fellow was forced to take the thing off. The John Wells Phonetic Blog of the 14th of October raised a question of lexicographical practice which I'd hitherto presumed hardly needed discussion. I'd always made what I've taken to be the obvious and nat·ral presumption that dictionaries regularly listed for any word its variant pronunciations (apart from those I refer to as 'special weakforms' on which see Section 4 §7 on this website) in the order of their judged frequency of occurrence in the ord·nry usage of speakers who have the acc·nt represented. This wd mean prioritising for each word its form as he·rd most offen to be articulated in neither a markedly formal, studied, delib·rate nor in a casual, negligent or markedly colloquial manner and — as when free from any special rhythmic pressure — in the manner of a citation. The blog was headed government and, referring to that word's entry in my (Oxford) Concise Pronouncing Dictionary, sed this: "In his CPD (1972) Jack transcribes this word as ɡʌvm̩ənt, and entirely iɡnores the possibility of n before the m. See also his comments in §10 of [this website Section 12.2 the review of the 1997 Roach-&-co recasting of the Jones EPD which sed] "the term government … can be heard every day over and over again in countless news bulletins and current affairs programmes. Both EPD and LPD list first the variant which contains the /-nm-/ sequence. However, anyone who listens at all attentively to recordings will soon discover that this is not merely not the predominantly heard form of the word, even in situations of the greatest prominence or highlighting, but that it is actually even a relatively unusual form of it". John's decisions, I now seem to gather with some surprise, are based on apparently rather proprioceptively perceived theoretical, ideal targets that speakers are presumed to have in mind, but may or may not achieve, and not simply on their observed practice. His decision regarding the item government indicated apparently that he considered it in essence only less usually not to contain an /n/ before its /m/. Thus he sez "I think my entry is correct. It unquestionably corresponds to my own slow-careful pronunciation of the word. I certainly don't have to make “a great deal of effort” to pronounce it as shown ... The alternatives that follow represent reductions which are also admittedly very common in speech — but they are just that, reductions... Some of these reductions may indeed be frequently heard from speakers, in radio or TV news bulletins as elsewhere. That does not make them the mentally stored forms, which are what I think a dictionary ought primarily to record". Surely reductions becoming new canonical forms whether in traditional orthography or only pronunciation are a vastly common feature of language development. Anyway, I find it impossible to accept that most GB speakers have in their repertoire of ordinary, non-formal, non-casual speech in any sense predominantly the form /`gᴧvənmənt/ for government. I'm perfectly confident that most of them hardly use that at all in such speech styles. Readers may like to know that when I askt John "Have you or anyone else referred elsewhere to this procedure for prioritising entries in lists of pronunciation variants?" his reply was "I don't think I had ever made the point about articulatory targets explicitly before." (personal communication 25 Oct 11). I cheerfully acknowledge that, with only very rare exceptions, I find that the LPD prioritisations are exactly such as I shdve indicated myself. But that's cert·nly not so in this case. If frequency isnt the essential criterion, one wonders where someone adopting these Wellsian criteria will feel free to draw the line say about whether or not to prioritise often or pestle with /t/? Or Wednesday with medial /d/? Or again with /eɪ/? Or because with /ɔː/? Or constable with /ɒ/? Or phonetic with /əʊ/? Or possible with medial /ɪ/? Or evening or several with medial schwa? Finally, with regard to JCW's remark "Even JWL’s CPD shows -nm- at inmate, with no other variant given", I shd like to point out that the /n/ of the /nm/ sequence in any word is not usually elided if it occurs in a strest syllable. It's very offen at unstrest syllables elided or assimilated to /m/. Readers who found this discussion of int·rest may see various closely related remarks at my Blog 190 'Tiananmen Square & Government' of the 6th of June 2009. PS USA lexicographers seem to recognise the /n / elision we've been discussing more offen than UK ones. For example the Oxford Advanced American Dictionary entry is /ˈɡʌvərmənt; ˈɡʌvərnmənt/ whose first version is clearly spoken as transcribed. Merriam Webster Online gives \ˈgə-vər(n)-mənt, -və-mənt; ˈgə-bəm-ənt, -vəm-\. The The Free Dictionary online British /gᴧvm̩ənt/ and US /gᴧvəmənt/. Also online InfoPlease has (guv'urn-munt, -ur-munt). Oxford University Press ELT, as that arm of OUP distinguishes itself, have recently issued a new publication the Oxford Advanced American Dictionary (hereafter OAAD) helpfully making much of it available online not only to computer users but also to iPad and iPhone users. It's obvi·sly essentially derived from the adm·rable OALD (the Oxford Advanced Learner's Dictionary). It provides comparable phonetic information including recordings demonstrating the pronunciations of all headwords and various other items. Its phonetic transcriptions are also happily in IPA with only minor differences from the OALD. One of these is that they follow, acceptably in this context, the US tradition of employing /y/ instead of /j/ for the yod phoneme. Another is the indication — surely rather helpful for those earnestly attempting to adopt such a style — at the entries which in US English largely have tapped varieties of the /t/ phoneme the notation, very familiar to many of us from its use in LPD and EPD, of the voicing indicator / ˬ / accompanying the /t/ symbol. This IPA voicing diacritic shou·d, in an ideal world, appear as a subscript miniature v centrally underneath it. The problem with these tapped t's is the typographical one th·t that subscript diacritic is so often unsatisfact·rily combined with the "t" it accompanies as I have to apologise will be all too evident in various places to readers of this text. In addition to these alignment problems, printers sometimes mistakenly substitute for that IPA voicing diacritic the IPA subscript loop sign [ ̮] for "Linking (absence of break)" which eg in the OAAD symbols key list appears not beneath but after the symbol to which it belongs (making one feel that one's somehow strayed into the LPD). Note that this example occurs at a keyword butter in that OAAD pronunciation key (which has its own entry online). The transcription's omission of the various superfluous length marks of OALD, in the Gimson-establisht tradition now so nearly universal in British practice, uses (so often in stark contrast with the quite short articulations to be heard) are certainly not anything this writer regards as any disadvantage. There is a useful note saying "Not all possible American pronunciations are shown in this dictionary. For example, some speakers only use the sound /ɔ/ when it is followed by /r/ (as in horse /hɔrs/) and use /ɑ/ in all other words that are shown with /ɔ/ in this dictionary, so that they pronounce both caught and cot as /kɑt/". "Unlike the OALD, transcriptions in the OAAD also include the symbol for the (usually voiced) alveolar tap, ̬t, as in ˈlɪ̬tl or ˈsɪ̬ti. In the OALD, words like these are transcribed with a plain t, the pronunciation also matching the transcriptions supplied. This is not so, though, for many other words, such as, for instance, parting, pronounced by the same American speaker as ˈpɑr̬tɪŋ in both dictionaries but transcribed as ˈpɑːrtɪŋ in the OALD and ˈpɑr̬tɪŋ in the OAAD". I'm afraid Alex was rather misled by the examples he happened to choose. He was certainly right to suggest that the OAAD (female) speaker didnt use a [d] type of articulation at city tho the OAAD male saying little does have that type. Actually apparently the same female American (which is presumably what her native accent is) speaker is heard in the OALD saying little with aspirated [t]. Trying out further OAAD items including bottle, cattle, rattle, settle and subtle, I found them all perfectly [d]-like. The internal evidence suggests that OUP in general used the same recordings for OAAD as they had made for the OALD American demonstrations but with certain improving revisions — little being one of them; abortive is another. At the OALD entry writing the British and American speakers with quite distinct (female) voices both pronounce the /t/ with aspiration, the same degree of it in both cases. In OAAD writer has the [d] type and so do lighter, lighting etc. As for the word parting, the American OALD and the OAAD transcriptions are exactly as promised in the books' pronunciation guides tho the latter's /-ɑr-/ has very weak if any rhoticity. Compare it with OAAD karting where rhoticity is perfectly clear. 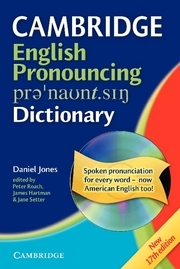 In 1997 the classic English Pronouncing Dictionary, which Daniel Jones publisht first in 1917, eighty years later underwent the most fundamental revision in its history. This was as its "15th edition" issued for the first time by Cambridge University Press in a version substantially redesigned by Professor Peter Roach. Since then it has undergone three further revisions culminating in the present "eighteenth". This has maintained the same dimensions as the previous edition but added a further 10,000 entries to the previous quota, presumably mainly the 'new words and names of people and places in the news' referred to on its back cover. An impressive change is that the transatlantic editor's position has now been assumed by the very distinguisht American phonetician John Esling a graduate of Michigan and Edinburgh Universities who currently occupies a Chair of Linguistics at the University of Victoria in Canada. Many improovments [sic] are to be seen in the int·rests of a more elegant presentation eg in the cover design and in the setting out and mainly-slightly reorganised wording of the introductory matter. A concise remark now appears 'The archaic name Received Pronunciation is no longer used' inste·d of a longer comment on why the accent represented is called (in almost no other serious work but this volume) "BBC" pronunciation. The former keywords employed are all now replaced by the offen-encountered 'lexical set' devised in 1982 by J. C. Wells for his Accents of English. At the final twenty-odd pages, the rather unsatisfactory Study Sections of the previous edition have been replaced by an excellent glossary of phonetic-etc terms. Another innovation has been the addition of a ten-page section, headed The World of Pronunciation, of short "essays on aspects of pronunciation by leading experts in the field" as they're described at the back cover. These are int·resting tho of inevitably mixt value to individual users. Especially notable is Jennifer Jenkins's Pronunciation for English as a Lingua Franca which claims startlingly that failure to distinguish between vowels of equal length (like the cat/cut pair) 'does not seem to cause intelligibility problems in [that] ELF communication'. So also is Linda Shockey's Shortcuts in casual English pronunciation which has a timely attack on the common misuse of the expression 'rapid speech'. Both of these can be commended strongly to students as tasters of their writers' work. Also int·resting is Catherine Sangster's The BBC, its Pronunciation Unit (she is its quaintly-titled 'co-ordinator') and 'BBC English' which usefully does much to concisely clarify its functions. It makes no comment on the EPD's use of the term 'BBC English'. One of these pieces is from the humble keyboard of your faithful bloggist under the title The Daniel Jones legacy. The omission of the 2006-edition's couple of pages of 'recommended reading' is something I shou·dnt expect to be regretted by more than a handful of users. The reddish-brown type now used for the headwords-etc differentiates their appearance from the darkish cyan-blue imitated from EPD17 in the LPD in 2008. The two major pronunciation dictionaries are practically identical in their most important features as well as in bulk and shape. And they're head-to-head in quality so the choice of one rather than the other now must for the purchaser depend on non-core considerations such as whether you want original-language versions of forren loanwords or not or whether you accord the greater importance to having the most recent items in the news. This better-than-ever EPD comes with the now-customary CD-ROM — sadly tho, as is the case also with LPD, only useable by devotees of the dreaded Windows. The first of these two which makes its disc available to Mac users will have a significant advantage. Kraut's blog of the 18th of October discusses the matter of its price and has jolly banter in the comments that follow his post. John Wells begins his blog of today (26 Oct 11), entitled "demurring", with a quotation from the Merriam-Webster online dictionary entry for the verb demur. His remarks begin by his reminding us that he's "always on the lookout for English intonation patterns that are not predictable on the basis of the general rules we know about". In particular he focuses on the the phrase 'I dont know' in its sense of 'disagree slightly'. As he sez "Politeness being what it is, we also use this phrase ... to show that we disagree strongly ... but don’t [want a] fierce argument". He adds, regarding the intonation usually adopted, "I think it has to be a rise". Pointing out the unsatisfactoriness of applying a Brazil type of approach, he sez "Why should demurring be referential, whereas straightforward disagreement is proclamatory?" and adds "How would you know that a falling tone is inappropriate and that you should use a rise?" To see why we regularly make the tone choices we do in these kinds of situation, I suggest he considers the difference between the fundamental significances of on the one hand (fully) falling tones and on the other (non-high) rising ones. The values of these I take to be as proposed in our Section 8 Item 3 'The Recognition of the English tones and their meanings' on this website. The use of a fully descending tone with its strong sense of finality wd be too likely to convey the cutting off completely of any attention to the idea, sentiment etc expressed by the speaker who's being ans·erd. On the other hand a (non-high) rise wd tend to indicate a mind fully open about the topic — even if not entirely in agreement. In tutorials on spoken English I've delivered over many years to students with very diverse native language backgrounds, when asking them to read aloud dialogs in ord·nry conversational English I've only occasionally felt inclined to criticise their tone choices — far less offen than so many books on English intonation seem to suggest one might expect. When I have done so, it seems to've been more offen than not to suggest that they'd improve the idiomaticness of their performances by replacing sentence-final fully descending tones with ones that were low-to-mid types. As I remarked at our Blog 203: Even quite fierce contradictions are normally expressed by native English-speakers with final rises, as in `Oh, no I’m ˏnot. Final fully falling tones in such situations wd be inclined to sound altogether too crushing. They might possibly even sound so angry as to provoke the complete termination to a fr·endship! Our Blog 298 in this series mentioned similarly that even a criticism like That’ll teach you to leave things till the last moment tho likely to be very unwelcome as `That’ll teach you to leave things till the last ˏmoment would be hatefully cutting with a final fall inste·d of that rise. The topic of Contradictions doesnt particularly figure in John's book English Intonation. Perhaps it will in a future edition. As can be seen from the nine items on transcription matters making up Section 9 of the main division of this website, the history and practice of phonetic transcription of (chiefly British) English, has long been a major int·rest of mine. So I was very pleased to be able to see a new book on this subject especially as it's been written by my good fr·end Professor Rafael Monroy-Casas of the University of Murcia in southern Spain. I first met him thirty years ago or more when he participated in a summer 'workshop' on English phonetics that I was conducting at Leeds University. Since then I've worked with him at his University from time to time — in total for more than three months. I've seen at first hand what a great contribution he's made to the teaching of spoken English to Spanish-speaking students. This book, whose title is that of this posting, is subtitled Theory and Texts. It has just appeared, as the 106th volume of a series begun in 2001 entitled "Linguistic Insights: Studies in Language and Communication" from the international academic publishing house of Peter Lang of Bern, Switzerland. It's a smartly presented paperback whose 280 pages are well printed with cert·n very minor exceptions. It's divided into four main sections. The first, Phonetic transcription systems deals with the International Phonetic Association's alphabet and the typology of phonetic and phonemic transcriptions. The second section, From theory to practice, goes into detail on the transcription of the English consonants and vowels, and describes "English vowel variation as reflected in the so-called strong and weak forms". It's interspersed with some various transcription exercises. Its last few pages have a few items where ill-advisedly-small print is squeezed into presentational 'boxes'. The third section, Corpus of oral texts, provides in ordinary orthography eighteen passages, a varied mixture of monologues and dialogues in length ranging from a half to a whole page. They are mostly quite int·resting and some even quite entertaining. Nothing is revealed about their sources but the names are given of the two male and two female readers who recorded them very effectively for the very useful accompanying CD which is, as is now customary, conveniently attached inside the book's back cover. This whole set of texts is used for each of the six types he selected for illustration in the fourth section Transcription systems for English the major final division of the book. These are termed by the author: 1. EPD p.88ff [ie Jones's 'Simplified' type]; 2. Edinburgh pp119ff [ie Abercrombie's type]; 3. Windsor Lewis pp141ff; 4. EPD-14 pp167ff; 5. EPD/LPD pp191ff; 6. OPD pp226ff. Comparing one version with another wou·d've been much easier if at each page of a transcribed passage the corresponding page numbers had been given for each of the other five and for the corpus texts. At each of the six sections the transcribed passages are preceded by offen detailed discussions and exercises. This ambitious work is in effect three books in one: a historical record, an account of the diverse current practices and an instructional manual. Its content is full of int·rest tho at times a few matters praps might've been more felicitously exprest. Cert·n mainly minor items will be relevant to the int·rests of so few of its likely readers that they might well have been omitted. One such is a complete set of the eighteen passages transcribed into the computer-readable SAMPA notation. The most widely welcome material will probably be its lively selection of passages with their well-recorded accompanying CD. This part of the book has a few aspects which tend to cause certain misgivings. The proud announcement by the publishers "Each volume of the series is subjected to a double peer-reviewing process" wd have one expect that the notoriously difficult jobs of checking and proofreading of texts full of phonetic symbols wd be performed with very great care but that's not quite the impression one gets. Despite the book's scrutiny in turn by the reviewers, the printers and the author and his 'collaborator' (named but not given any detailed credit) various lapses from accuracy are to be noticed. Many of what a reader may easily take initially to be mistakes turn out to be due to the peculiar decision of the author on a procrustean policy of replacement of what the speakers actually sed with versions considered more suitable models for the learner. This is clearly so for example at p.209 where suppose is shown with a schwa but a note remarks that the word is 'often pronounced' without one: which in fact is the way it is pronounced by the reader. Various Northern-type pronunciations of the readers have been converted to the corresponding General British forms eg /pɑːst/ is shown where /pӕst/ is used, a procedure also employed at advantage, nasty and telegraph. Linking /r/ is occasionally inserted where no link was made. Various unused consonants are shown at eg only, lands, seconds, districts, prospects (tho at hands on p. 208 an 'optional elision' is allowed to be unamended). An extra unused /n/ is inserted into five utterances of government. Pessimistic has its less orthodox /z/ replaced by /s/. Similarly, perfectly idiomatic stronger forms of the and to may be converted to their regular values in some situations. The adverbs actually, obviously and seriously are uttered with the currently normal non-diphthongal medial syllables but they're shown in somewhat more old-fashioned forms so offen still suggested to be their most usual ones in dictionaries. This very unusual procedure may be considered by some to be pedagogically desirable but it's of potential disadvantage to the most advanced students and rather problematic in that its employment is acknowledged on so very few occasions. One wonders whether it was actually approved of by the publishers' advisers. Aside from these anomalies, there are rather more misprints than one expects from a leading academic publishing house. The controversial diphthong [ɒʊ] (not admitted to any other dictionary than LPD3), referred to by the author as "a variant of /əʊ/ used by Wells", appears in places eg where the speaker clearly used the normal [əʊ] eg for cold three times at p. 207. There are many noteworthy points raised in the numerous notes added below the transcriptions. It's not been possible in this short account to do justice to all the good things that this book offers but I've cert·nly found it fascinating. I expect many colleagues in the EFL world will share my reaction. Flogging the dead horse of "RP"
The recent raucous rambling radio diatribe agenst "RP" by Melvyn Bragg that we've been discussing seemed to demonstrate the fact that most of those who've taken to bandying the unfortunate term about in the last two or three decades either dont understand what it means or subjectively impose their own meaning on it — or both. Happy the days when for about half a century it wasnt possible to use the term in public because it'd mystify the laity. What Daniel Jones so ill-advisedly ended up in 1926 apologetically calling 'Received Pronunciation' has now become a favorit expression of popular journalists but it's increasingly eschewed in the serious phonetics world. When I rejected "RP"' in favour of 'General British' (in 1972) I felt that it and its abbreviation 'GB' made for convenient parallelism with the well establisht GA etc. 'General American' became quite widely institutionalised after George Philip Krapp employed it in his The English Language in America in 1925. It became re·dily understood to be short for the 'General American English Pronunciation'. I felt 'General British' happily lent itself to similarly concise use. Others have preferred different terms some of which have been discussed at our blog 274. Blog 297 is also relevant. On the matter of reading the burial service over "RP" or calling it "marginalised", it's puzzling that various apparently well-informed people shd think that there's anything seriously significant about just what percentage of the British population speaks an unadulterated version of it. Can it be a 'thing' about not "possesssing" it that causes them to take such int·rest in such a trivial matter? One doesnt question Trudgill's three to five percent estimate arrived at in the course of his work on The social differentiation of English in Norwich because it's obviously as reliable as such a dou·tfully meaningful figure can be. Our blog 360 gave some of the reasons why bothering to try to establish such a figure with any great precision is a relativ·ly futile preoccupation given the lack of cert·nty in delimiting the accent. It might be of int·rest to those who seem to make so much of the statistic that "RP" is spoken (unblended) by only 3 to 5 percent of the British population that, in Trudgill's same survey, he suggested that "only 12 percent of the [UK] population were speakers of Standard English...". If relativ·ly few do use "RP", they're still a goodly proportion of UK sophisticated speakers, tho very many of these use a blend these days cheerfully unconcerned that they may be revealing some or other regional affiliations. One reason that it's inconce·vable that "RP" will ever be supplanted by any other British accent in EFL teaching is that so many of its characteristics coincide with or have become incorporated into the other 'educated' forms of British speech, whether consciously or not, as to make it something of a 'common denominator'. Its influence pervades the usages of all speakers in the UK who arnt 100% users of it. Tho so many non-"RP" speakers adopt "RP" elements how many have any inclination to adopt any elements of any other variety of UK pronunciation — even one they may profess to admire? It seems very likely indeed that almost all of those who rail agenst "RP" are flogging a de·d horse because they have in mind styles that, for very much the most part, are either tremendously old fashioned or have died the death completely. It seems highly likely that the otherwise-sophisticated ones among them dont realise that those who use the term "RP" as a scientific categorisation merely do so to identify a form of UK speech which displays no re·dily observable regional affiliations. It seems very hard to believe that they have in mind the inconspicuous typical usages of for example the majority of broadcasting newsreaders. So far from disappearing, "RP" has never been so alive or so powerful in its influence. Pity about the so politically inept name so many people cling to for it. It's been paining me to use it but I've been holding my nose and strictly giving it quotation marks. The phonetically naïve of this world seem to be forever circulating a curious variety of myths regarding the nature of various uses of the human vocal apparatus. Some are firm traditions especially found among teachers of elocution and singing. Others are being daily dremt up by individuals. A variety of examples from the choral world are given by John Wells in his blog of today "Warming Up". These've reminded me of instances recently encountered in that egregious Melvyn Bragg BBC Radio 4 program entitled "RP RIP?" that I've already described something of. It included an archive clip of a BBC Brains Trust session from some time in the 1940s in which the question put to the panel (who always gave completely unscripted replies) was "How can I improve my .. speaking voice". The reply we he·rd came from Commander A. B. Campbell, a retired merchant-navy officer from the south London suburb of Peckham, who was the joker in the pack — noted not for his intellectual gifts but for his vast store of farfetcht stories to fit any occasion. His comment was that he'd been told by the president of a society called The Voice Beautiful that he'd got "a very naturally fine voice" which evidently from their laughter convulsed the other members of the panel who seemed to collapse completely when he continued with staggering inconsequentiality to add "He told me, as a matter of fact, the vocal cords had no effect whatsoever on the voice. You could talk just as well without your vocal cords provided you could use your sinuses." Very shortly after that, Baron Bragg quoted the highly intelligent Baroness Joan Bakewell, who actually chaired some later sessions of the Brains Trust and incidentally was so glamorous in her prime that she had the nickname of "the thinking man's crumpet". She was he·rd recounting her story about how she felt at an acute disadvantage arriving at Newnham College Cambridge from Stockport High School for Girls and finding her fellow students from top girls' "public" schools speaking with "quite honking posh accents." Thoroughly "intimidated" she thaut this had to be "remedied" meaning that she had "to change and adapt or you won't survive". She sed she "came out of the loo where I'd gone to consider all this" speaking with a similarly posh accent. It makes one wonder what the difference was like because she sed in her autobiography that, while at school, she'd been "sent to elocution classes to iron out virtually my entire speech". In a preliminary test before beginning those lessons, she admitted "I scored the worst. It was a shock to be told that everything I said was wrong". The other item in the Bragg extravaganza I found highly amusing was the excerpt from the sound track of a television interview of the onetime BBC overlord John Reith by Malcolm Muggeridge. Reith showed himself to be so tin-eared that he appeared to believe he didnt have a Scottish accent. His comment, on being told by his interviewer emphatic·ly that he did have one, was to ask Muggeridge to say what he called "the stuff coming down that chimney". At the reply /sʊt/ he sed that "The Scot and the Northerner wd say [sut]... I /ðɪŋk aɪ seɪ sʌmmɪŋ/ between the two, keeping the purity [sic] of the vowel — or double vowel." He then made a quite incomprehensible remark upon demonstrating items like /fɑːsaɪd/ for fireside which must've been examples of the "Oxford accent" to which he sed he was "vehemently opposed". Muggeridge's response was to snigger indulgently but presumably placed his own speech bang in that hated category if only when he came to use the word society which he pronounced [sə`saːːtɪ]. Incident·ly "Saint Mugg", as Muggeridge was satirically known in his late years of noisy adoption of religion, presumably had something of a similar accent conversion to Bakewell's. He came from a strongly Labour background and went to a London suburban grammar school (in Croydon) but ended up with a very conspicuously posh accent by contrast with at least one brother of his whose speech was very much more evidently London. When I visited South America in the 1990s I was quite surprised to find that British English pronunciation was so widely and indeed enthusiasticly tau·t. Recently I've received over the years numbers of questions from Argentinian correspondents on the subject. One of the latest was criticising the customary range of activities their courses included. He sed "I think London regional RP should be included. That's what everyone hears when visiting London and talking to people in the street or in pubs (not to mention the Cockney speakers); and then our teachers and students are told they sound like tapes or like Victorian ladies." I'm not inclined to agree with him. I'm not totally surprised that some few of his students shd've come back from visits to London pondering over having had some such odd unkind remarks made to them but my advice is to ignore them. I cert·nly dont advise active cultivation of marked Londonisms. If his students were to attempt that sort of thing they're just as likely to return home with ringing in their ears remarks like "Who tau·t you to sound so Cockneyfied?" Mainstream General British (aka 'RP') is the only realistic target for students aiming at a British pronunciation. Unfortunately my correspondent only made that general observation and I suppose cou·dnt give me any specific examples of particular pronunciations that were adversely commented on. It cou·d well be that those comments were based only on non-mainstream praps markedly old-fashioned usages such as /`sjuː pəmɑːkɪt/ for supermarket. He did give me one concrete example when he sed "As for the forms of /u/ and /u:/, I've noticed that even though this is clearly mentioned by Cruttenden's book, which is required reading, teachers and students still use the fully back variety". I've tau·t many Spanish-speaking students in working for a year in Spain and many from South America on numerous summer courses in England and I can't recall ever being really concerned about excessive backness of their / uː /. Some have failed to adequately differentiate / uː / from / ʊ / which is rather a different problem. It's true that many younger speakers have a very front /uː/ but I think one shd be very cautious about recommending imitation of them. I may be rather heretical in my views but I'm in favour of a Spanish speaker having some slight degree of a Spanish accent in speaking English. I dont necessarily feel comfortable to hear what may sound too much like an impersonation of an individual English native speaker. The ideal target for any user of English as an extra language shd be in my opinion perfectly easy comprehensibility not complete Englishness. The GB vowel / ʊ / as in put has no precise equivalent in Spanish and is therefore very likely to be attempted in a form too much like / u: / but, as diagrams show, it has as much the quality of / ə / as of / u: /. Saying / ə / with rounded lips should help to produce a satisfactory / ʊ /. The GB vowel / u: / as in too should give no quality problems but it may sometimes be uttered in an inappropriately brief (or occasionally excessively stretched) form. It is usually a fairly long vowel so that, given the typically short value of the quality-comparable Spanish vowel, it may sound markedly brisk or clipped and uncomfortably like the more regularly short English vowel phoneme / ʊ /, as when eg soot may sound too much like suit. It has its minimum length in a syllable closed by one of eight “sharp” English consonants /p, t, k, ʧ, f, θ, s / and / ʃ /. Diagrams for GB vowels may be seen at §3.1.46 and for Spanish at §9.2 on this website. Readers may be int·rested to learn that a new eighth article has been added to Section 4 of this website dealing with all the GB English vowels and consonants for Spanish-speaking users of English as an extra language.